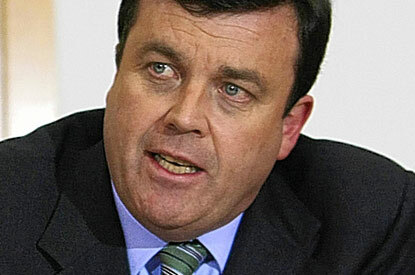 Even for Ireland's youth, for whom politics has come to symbolize little more than student emigration, economic ruination, and misery, there was a palpable sense of sadness at news of the death of former Minister for Finance, Brian Lenihan early this morning. I learned of the late Minister's death via Facebook, the same way I heard of the recent passing of the late former Taoiseach Garrett Fitzgerald, and there's a frankness and honesty to that medium that can capture the emotions and feelings of the 'everyday man' or woman better than any news report can. People spoke admiringly of the Minister's valiant and courageous battle against an in-conquerable disease, and of how bravely he'd carried on the impossible fight till the end, all while shouldering the most onerous of ministerial responsibilities, and steering Ireland through a financial crisis that few, even he, could have foreseen. Minister for Education Ruairí Quinn's recent backtracking on an explicit promise to oppose a raise in college fees just before the election has sunk politics to a new level of grubbiness and un-trustworthiness among Ireland's youth, many of whom are now left without re-assurance that they will be able to afford college tuition in as little as two years, but today's epithets and news reports of the late Lenihan, who epitomized the brave, noble, and courageous statesman that he was, makes the whole system seem as if it retains at least a shred of dignity. My last, and I think the only time I saw the Minister in person, was when he delivered the annual summertime oration at Béal na mBláth, the site where Michael Collins was gunned down, last summer. My abiding impression of that afternoon was of seeing such a strong, impressionable, and handsome speaker that it made me sad that that same man had a ticking time bomb inside of him, and was literally waiting - although you'd hardly know it - for his time to die. Renowned for his sharp intelligence and leadership skills at a time when the government was widely perceived as being clueless and incompetent, it was possible to draw a faint parallel between himself and the slain Michael Collins, also a Minister for Finance although of a different party and stripe, at whose approximate graveside the late Minister was delivering the oration. I even remember my curiosity prompting me to ask the Fianna Fáil party sympathizer at whose behest I had attended the event to ask how the Minister was faring with his treatment, before being told, with an air of despair, that pancreatic cancer, of which the Minister this morning died, was virtually impossible to treat or cure. There's also a sense of surrealism at the fact that so little had been said of the Minister's disease since it was publicly announced by TV3, even, allegedly, before the members of his family had been told, in late 2009. There was no story days or weeks before the Minister died to morbidly inform the public that his health had 'taken a turn for the worse', as so often happens when the end is nigh. The most touching part of today's reactions to the Minister's passing, though, is that the sheer humanity and courage of his brave struggle with cancer so clearly transcended politics. Just as his death drew heartfelt messages of condolences from political foes, so too even the ordinary Irishperson, for whom Lenihan, as Minister for Finance during the disastrous Fianna Fáil years, could have been so clearly implicated as a vital cog in the wheel of a system that so devastatingly wrecked the country and its public finances, couldn't help but feel deeply sadenned by the news of his sudden passing this morning. If there's someone callous individual who feels that the Minister got his just deserts, I haven't met him yet. Most of all, though, for the way he carried on so bravely and courageously in the face of his terminal illness, even to the extent that people forgot seem to have forgot that he was dying, he will rightfully be remembered not just as a great politician and public servant, the scion of an illustrious political family, but, in the so-often dim firmament of modern Irish politics, as a shining example of humanity and courage, and, ultimately, as a hero.